Home > Ask Our Experts > Do Rabbit Droppings Attract Mice or Rats? Do rabbit droppings or rabbits attract rats or mice? The short answer to your question is yes, they can, but then so can a lot of other things – even in the tidiest of gardens – including compost heaps, wild-bird feeders and chicken houses. Rats have been living in shadowy parallel alongside us for centuries and the bottom line is that they’re really very, very good at what they do; few animals can match them for adaptability and readiness to spot a golden opportunity. Unfortunately, this often means they see our homes as the ideal chance for a free lunch (and breakfast, dinner and supper besides) – especially if we keep pets that eat broadly the same kind of food that they do. However, just because rabbits can attract rats, it doesn’t automatically mean that they have to; fortunately there are precautions that you can take that should minimise the risk, and with these wily expert scavengers, it always pays to be on your guard. Don’t Send Out an Invitation! The most effective way to avoid attracting rats is to make sure you’re not sending them an open invitation. The trick is not to advertise and don’t make it too easy for them to get an easy meal. Rats have a very good sense of smell and old country lore has it that they can smell chickens from a mile or more away. Cleanliness is a powerful weapon in the fight to keep your rabbit hutches and pens rat-free so it’s vital to ensure you regularly remove uneaten food, droppings, soiled shavings and old bedding – and ideally dispose of it in a sealed bag, inside a bin with a secure lid. You’ll never mask the smell of rabbits entirely, or any other pet for that matter, but with simple good hygiene, you should be able to make it seem less enticing to ratty and his friends! Depending on how many rabbits you have, or you’re thinking of keeping, you’ll often find that bulk-buying feed makes obvious economic sense – but take care how you store it. Soft paper sacks of lovely fresh grain in an outbuilding that hardly ever gets visited is a bonanza for a rat, so keep your pet-food supply in a secure, rat-proof container – ideally made from strong metal, as the gnawing ability of rats is rightly legendary. Even if you’ve never seen a rat around your rabbits, it’s important to stay vigilant. Some rabbit keepers have reported very good results with ultrasonic anti-rat devices, so long as they are aimed away from the rabbits themselves. Others work on the basis of using bait stations in the same way as gardeners use slug pellets; they may not be aware of a particular problem, but it’s a great way to ensure that one doesn’t develop. Which approach you take obviously depends on your own personal circumstances, but if you do opt for using poison, it’s essential to use it correctly, so be sure to read the instructions carefully and then follow them – especially if there are children or other pets to consider. The thought of rolling out the red-carpet to a bunch of free-loading wild rats is, clearly, a repugnant one, but with a little forethought and a few simple precautions, you should be able to keep the hungry hordes at bay. 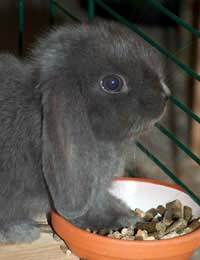 You certainly needn’t let the fear of these pests put you off the idea of keeping pet rabbits if that’s what you really want to do. @Marie- poor rabbit - shouldn't be in cages :( should be left to roam free. @Nat - but don't you think keeping a rabbit indoors is cruel. A rabbit should have freedom to be outside and do the things it likes to do, such as eat grass. Any food can attract rats, even crumbs left out on our floors. I Kno that rats could chew on a pet rabbit, but what about mice? ?I see lots of information on the rats and people mention mice.However, I have not seen anything that says mice could chew on live Rabbits.Please help!I raise English Angora Rabbits and one of them is getting her ear chewed.I know I have mice but not rats I have tried so many different things to try to rid the barn of the mice but it is an endless battle.Thanks for any help you can provide me! I thinks there's a rat living in my shed where my rabbit runs free, there's nothing in there only shavings,hay etc. I'm not sure how to get rid of them as I don't want to poison my rabbit and is my rabbit at risk? @Rina - rats will eat ANYTHING. Of course they will eat rabbit food and bird food. They are renowned for it. My neighbor puts out Rabbit food for the wild rabbits in our neighborhood. We now have rats around the yard.I told her they are probably enjoying the bunny food she puts out.She says that rats don't eat bunny food, is this true? Okay I had a rabbit once. He passed away not to long ago and it sounds like a rat or a mouse is in my room. Do you know if there's a way to scare them off or should I just go ahead and get poison or something the be rid of it/them? @Lemon grab - I'm afraid that if you attract mice, you might also attract rats. Also, wild mice would die if they were to be kept as a pet as they are not accustomed to being handled by humans. Plus, if you attract one mouse, you will attract a whole family of them which in turn will create its own problems. If you want a mice as a pet, I suggest you visit a pet shop to buy a domesticated mouse. Even domesticated rats and gerbils make very friendly and lovable pets.